Beth Pascall. When Salomon-sponsored athlete Beth is not out running in her local Peak District hills, she works as junior doctor specialising in paediatrics. Since taking up ultra-running in 2013, she has made a big impact on the British ultra-running scene. Beth is the current Lakeland 100 course record holder (21hrs 29mins) and the winner of many other British races including the Highland Fling and The Spine. 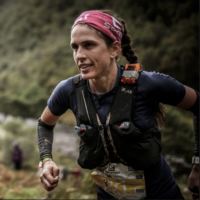 She has also excelled internationally on the World Trail Tour, finishing 2nd in the Madeira Ultra Trail, 6th in Diagonale des Foux, and 4th in Transgrancanaria. In 2018 she represented Great Britain at the World Trail Championships in Spain, finishing an excellent 11th, and later in the world’s most competitive trail race – the Ultra Trail du Mont Blanc – she finished 4th. Beth’s blog is well worth a read. Katie Kaars-Sijpesteijn. An ultra runner for eight years, Katie is also sponsored by Salomon. She is mountain runner who is perhaps most well-known for her record-breaking performances in some of Britain’s most competitive trail races. She is the current ladies record holder in the Lakeland 50 (8 hours and 2 minutes) and Lakes In A Day (10 hours and 45 minutes), a race which she won outright in 2018. 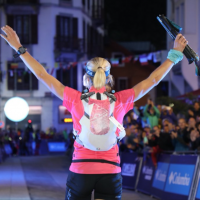 She has also competed at a very high level in some of the world’s toughest mountain races including the Madeira Sky Marathon, Trofeo Kima, Glencoe Skyline, 80km du Mont Blanc, and the Gore-Tex Maxi Race. Katie has started 2019 very well with a second place finish in Reventon Trail El Paso on La Palma. Later this year she will be representing G.B. for a third consecutive year in the IAU World Trail Running Champs. Gary House. Hailing from North Wales, Gary is a self-employed Coach, Running Technique Specialist and Nutritionist at RunStrong. Gary’s passion is for ultra-running. A relative newcomer, he is already competing at the sharp end of the sport. He has won the Equinox 24-hour race twice (in 2015 and 2016), covering 200km non-stop, finished 2nd in the Liverpool to Leeds (135 miles in under 24 hours), and covered an excellent 200km in the Barcelona 24-hour track race. In 2018 he finished 12th in the 50 mile Highland Fling Race and 3rd in the 75 mile Pen Llyn Ultra. Gary started 2019 with an impressive 2:47 marathon P.B. in Barcelona. His main goal for the first half of the summer is the infamous Dragon’s Back Race. Peter Abraham. Altrincham A.C. athlete Peter Abraham has been running competitively for ten years. In 2016 his attention turned from the shorter distances towards ultra-running, and he produced some very notable performances in the The Wall, Thames Trott, Canalathon, Adidas Thunder Run, and the Ultra Tour of Suffolk. 2017 was a good season for Peter and included a 3rd place finish in the British 50km Road Championships, a nine hour Lakeland 50, and a great 15hrs 58mins in his first ever 100 miler, The Autumn 100, where he finished 3rd overall. In 2018 Peter has continued to improve in ultra-distance events with an outstanding win in the Connemara 39 mile road race and 27hrs 30mins in the Lakeland 100 for 21st position. In 2019 has two very big goals – the Comrades Marathon and the Spartathlon! Stian Dahl Sommerseth. At 21 years of age Stian is the youngest and most recent member of the VO2max Coaching team. Stian hails from inside the Arctic Circle (Tromso in Norway), is a student of law, a former soccer player, is sponsored by Hoka One One, and has been running seriously for two years only. 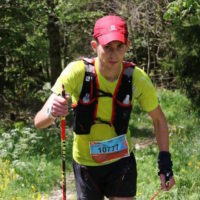 In this time he has competed successfully in many mountain running events including Tromsdalstinden, the Kielder Dark Skies Marathon, and the Eiger Ultratrail 35km (2nd overall). He also has personal best times of 15’30” for 5000m, 32’08” for 10km, and 70’51” for the Half Marathon. In September Stian also competed in his first road marathon in Berlin where he finished in a very impressive 2hrs 32’40”. He’s also just started writing a blog! Daniel Shaw. Dan has been running competitively since 2012. In that time has racked up an impressive array of performances in Mountain Ultra Trail events in the UK. These have included the Ultimate Trails 100km, the High Peak 40, the Peaks Skyrace, the Lakes 3 x 3000m Ultra, the Kielder 80k, the Green Man Ultra, and the Ridgeway Challenge 86. So far in 2018 Dan has been continuing in much the same vein with great runs in Transvulcania, the Kielder 50k (4th overall), the Grand Tour of Skiddaw (5th), and the Scafell Pike Marathon (7th). For the rest of the year and into 2019 Dan will be trying something a little different and targeting a number of road races before turning his attention back to the trails and the Hoka Highland Fling. John Yells. John competes for legendary Scottish hill running club Lochaber A.C. and is the most recent addition to the hugely popular and moderately successful VO2max Coaching family of athletes. At 26 years of age and a serious mountain runner for just a few years, John has already racked up an impressive series of performances in Scottish hill racing. These include Goat Fell, Jura, the Carnethy Five, Aonach Mor, and Stuc A Chroin. In 2018 he competed strongly in the Scafell Skyrace. In 2019 John will be focusing on the Scottish hill running championships, the Long Classics, and the infamous triple crown of British hill running – Scafell, Snowdon and Ben Nevis. Stuart Crutchfield. Based in Fort William, Stuart also runs for fabled Scottish hill running club Lochaber A.C.. 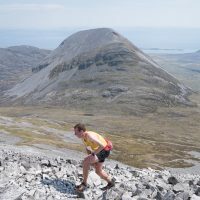 In the five years since he started running competitively in the mountains he has raced most of the North’s toughest hill races, including Isle of Jura, Arrochar Alps, and Ben Nevis. Stuart has had a great season of uninterrupted racing in 2018 and shown considerable improvements in all of his race performances. His most impressive runs have come at Isle of Jura (11th), Scafell (17th), The Ben Nevis race (50th), Beinn Resipol (8th), Stuc a’ Chroin (10th), and Cioch Mhor (7th). In 2019 he’ll doing pretty much the same kind of thing, only faster (we hope! ), although over the winter he’ll be working on his speed and competing in his first ever Park Run. Stuart does not have a blog. George Foster. George is a 31 year old mountain runner from North Yorkshire. A member of Keswick A.C., he has been running competitively for six years. 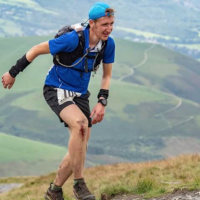 His main interest lies on the fells and in longer mountain races, and has performed well at Wasdale, Kentmere and Langdale, and at the Glencoe Skyline. In 2016 he also completed the Bob Graham Round. Since joining the VO2max Coaching team in 2017, George has laid down a successful season of cross country and road racing, along with an excellent summer of hill running. Highlights have included 4th in the Matterhorn Ultraks 30km, 4th at Scafell, and a win in the Lairig Ghru Mountain Marathon. George also has a great blog – www.fellicionado.com – which documents his running, rock climbing, and various other interests. Chris Richards. A third year Sports & Exercise Science student at Bangor University, a Salford Harrier, and a Salomon UK sponsored athlete, Chris has been running for 6 years. He has made steady progress on the fells and over cross-country, and has been a regular member of the England mountain running squad. In his final year in the Junior ranks (2017), Chris won both the British U20 European and World Mountain Running Championships Trials to gain his first ever Great Britain vests, and finished a respectable 15th and 16th in the respective championships. In 2018 Chris came 7th in his first Senior GB Athletics World Mountain Running Championships Trials. He has also recently ran road PBs for 5km (14’45”) and 10km (31’00”). Ally Beaven. Hailing from the Orkney Islands in the north of Scotland, it’s no surprise to find Ally most at home in the mountains. Ally has performed at a high level in many of the UK’s toughest mountain races, including the Dragon’s Back, Mourne Skyline Mountain Trail Race, Glen Coe Skyline, Lakes Sky Ultra, and the OMM. In the summer of 2017 Ally took his mountain running to another level when he completed the spectacular Euphoria Del Cims, a 233km ultra in the Principality of Andorra. In March 2018, along with every other athlete, Ally failed to complete the infamous Barkley Marathons. A little later in the year he finished 22nd in Trofeo Kima, one of the world’s most technical mountain races. You can read all about this and more (including his sub-4 hour run around the Cairngorm 4000s) in his excellent blog. James Callender. Based in Glasgow and running for Westerlands, James has been running competitively for about six years. For him the distance or the terrain doesn’t really matter. The main thing is the running. During the winter he focuses largely on road running and has ran a number of PBs this year, including 56’17” in the Preston 10 miler and 75’05” in the Strathaven Half Marathon. In 2018 James also completed his first ever road marathon in Barcelona, posting an excellent time of 2hrs 40mins. James is perhaps better known as a hill runner and runs anything up to 20 hill races each year. This year he finished in 42nd position in the Isle of Jura hill race in 4hrs 20mins, a personal best performance by 41 places and 19 minutes. Chris Collins. Hailing from County Antrim, Northern Ireland, Chris is from a road-running background (with PBs of 17’55” for 5km, 37’24” for 10km and 3 hrs 08 mins for the Marathon), but more recently has turned his attention to ultra distance trail running events. This year he has competed in the Hoka Highland Fling 53 mile ultra, and most impressively has improved his course best in the 40 mile Causeway Coast Ultra Marathon from 7hrs 10mins to 6hrs 25mins. For the winter season Chris intends to work on his road P.B.s, in particular that illusive 3 hour marathon mark, and return to Scotland for the Highland Fling.